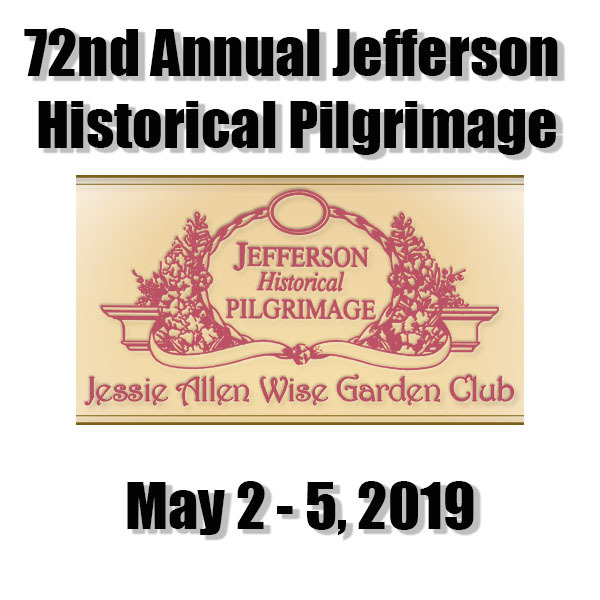 The Jessie Allen Wise Garden Club presents the 72nd Annual Jefferson Pilgrimage. Celebrate the beauty of spring and take a trip back to the 1860s as Jefferson’s annual Pilgrimage starts with the infamous Diamond Bessie Murder Trial. Don’t miss the Historic Home and Garden Tours Friday, May 3 and Saturday, May 4, and additional Pilgrimage activities including the Pilgrimage Parade and town skirmish! Enjoy the salad buffet luncheon at the Excelsior House Hotel, and tour Jay Gould’s private rail car, the Atalanta. New for this year, enjoy hearing our traveling medicine man, Dr. Doc Plumbob. In front of the Jay Gould Car following the town skirmish and again at 2:00. No admission charged.